A Letter from our Executive Director: We Need Your Help! McDowell Mission Ministries Web Page! Some of you may already be familiar with our organization. You might even be a supporter. If you are, great! Let me say thank you, and encourage you to read on anyway. You deserve to hear what your dollars are making possible. If you are not familiar with us then I hope what you read in the following paragraphs will excite you and motivate you to team up with us as we work to improve the lot of the disadvantaged in our county. McDowell Missions was founded in July 1993. We started humbly as a homeless shelter for men. We were located next door to DSS on East Court Street. The very day that we opened we received our first resident and we have been going strong ever since. In 1995, we moved to a new location across from the Drexel Furniture plant. It was here that we began accepting women and giving away some food boxes. In 1998, we moved to the old County Health Department building on State Street. That same year the Christian Clothing Center united with our ministry. In 1999 we purchased the nurses annex from the old hospital site on Fleming Avenue. The building had fallen into disrepair and received frequent visits from law enforcement. We converted it into a 40 bed shelter to house women and children. In the year 2000 the McDowell Prison Ministry united with us and we started supplying benevolence assistance to help people afford gas, heating fuel, rent, water, pharmaceuticals, and more. We also birthed the transportation ministry that provided rides to people that needed to go to the doctor. Because we were performing this ministry we won a contract with DSS to provide transportation to Blue Card Medicaid recipients. In 1998, 2003 and 2005 we assisted Old Fort, Burke and Catawba Counties in starting ministries in their communities. We did all this while caring for our own. God is good. Mcdowell Mission Ministries has changed and evolved over the past 25 years, as all organizations must. Transportation services are now offered by McDowell Transit through the Department of Social Services, though we continue to provide transportation for our residents as often as possible. We no longer run the McDowell Prison Ministry, but instead partner with Freedom Life Ministries' local prison ministry to provide help for those that have been incarcerated. The Christian Clothing Ministry is now the McDowell Mission Ministries Resale Store, and both it and our shelters have seen a number of renovations over the years. 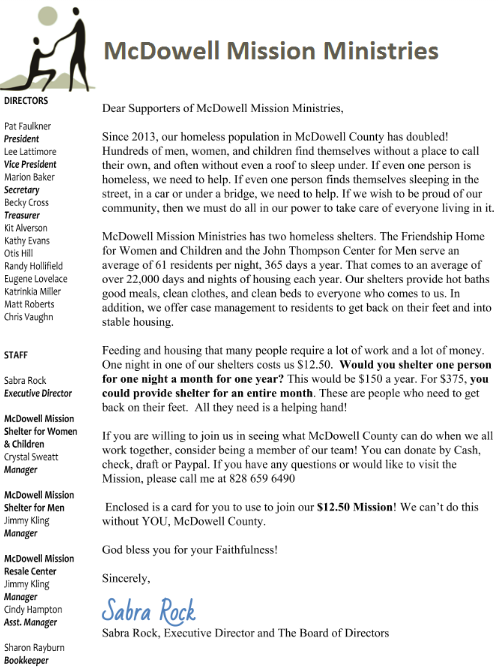 Yet through all of these changes and despite economic troubles in our community and beyond, we continue to serve the homeless of McDowell County and beyond. We have found over the years that many folks do not believe there is a homeless problem in our county. This is probably due to the fact that residents rarely see the homeless sleeping in alley ways or under bridges. The truth is that over we serve over 300 men, women and children in a given year. All of these clients receive food, shelter, clothing, and counseling; some for only a night and others for much longer. Our shelters are unique in that we do not make residents leave during the day. However, we do hold them accountable while they are staying with us. To keep a bed at our shelters a client must be actively seeking employment, attending school, or in the disability process. Furthermore they must submit to regular drug and alcohol testing and keep all curfews. All clients are required to complete a daily chore and complete a set number of volunteer hours each week. When a client finds employment we assist them with transportation. While they are at the shelter we provide three meals, a warm bed, and supplies to bathe and wash their clothes. If they have no clothes, which is often the case, we offer clothing from the Resale Store for free. We also offer case management, which generally means identifying goals for obtaining a stable income and housing and helping clients to achieve those goals. This may include assisting clients in obtaining valid IDs, Social Security cards, and other legal identification documents, referrals to substance use counseling, connecting clients with local landlords, encouraging and supporting clients with medical and healthcare concerns, or helping with applications and resumes.